User wants to do X. User doesn’t know how to do X, but thinks they can fumble their way to a solution if they can just manage to do Y. User doesn’t know how to do Y either. User asks for help with Y. After much interaction and wasted time, it finally becomes clear that the user really wants help with X, and that Y wasn’t even a suitable solution for X. This seems like an apt summary of the entire WestConnex project. Their stated goal is to “bust congestion” by widening the existing motorways and building new motorways to “fill in the missing links” in the existing motorway network. This involves the construction of massive new tunnels, which need ventilation shafts to remove the pollution (and release it into the atmosphere). There will be spaghetti junctions so cars can navigate the complicated interchanges. The increased capacity of each new road section merely pushes the congestion to another location down the line. Each new bottleneck in turn must be upgraded to increase its capacity. The end-goal shouldn’t be to “bust congestion” by allowing more cars through the system. The real question is, how can we help people to get to their destination? WestConnex proceeds on the assumption that everyone wants and needs to drive. We therefore need to widen all of the roads, never mind the destruction, and damn the expense. It would be a whole lot simpler, cheaper and less disruptive to spend the billions of dollars on public transport, which doesn’t require the complicated (and ultimately futile) solutions that they’re blundering through for WestConnex. 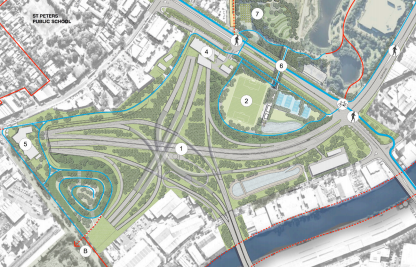 Everyone involved in WestConnex needs to take a step back, and ask what the problem is that they’re really trying to solve.